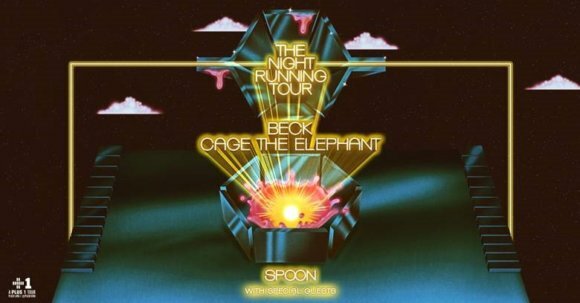 Beck and Cage The Elephant will co-headline “The Night Running Tour” beginning on July 11, 2019 at the Sunlight Supply Amphitheater in Ridgefield, WA. The North American tour’s set to hit 28 cities including Las Vegas, Phoenix, Dallas, Indianapolis, New York, and Charlotte. “The Night Running Tour” will finish up at the Coral Sky Amphitheatre in West Palm Beach, FL, on August 30th. Beck and Cage The Elephant will be joined on select dates by Starcrawler, Sunflower Bean, and Wild Belle. Spoon will join them on each of their 28 stops. Tickets will go on sale on Friday, February 15th at 10am local time via LiveNation.com. $1 from every ticket sold will be donated back to each city they’re playing in to help end hunger.